2014 W 9 is not the form you're looking for?Search for another form here. What is the W-9 Tax Form? Tax season brings many challenges and headaches each year. The stress comes to an end on April 15th, but until then, we have to complete our tax forms, calculate taxes and fill in financial declarations. No matter how much money you’ve made during the year, you still have to inform the IRS of your income. Working as an independent contractor, freelancer or sole proprietor has lots of benefits. Imagine that you don’t have to go to work every day. You can plan your day as you wish. But still you must fill out tax return forms. If you’ve received money from another sole proprietor or company, you’ll definitely receive IRS form W-9 to complete. 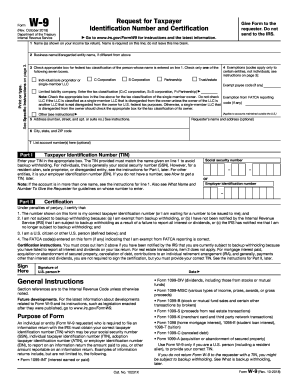 This form is a Request for Taxpayer Identification Number (TIN). It is sent by the HR managers of large companies or individuals to their employees who received payments for services provided. 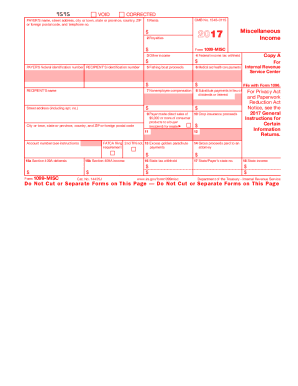 W-9 form is not sent to the IRS. The information in the form is essential for filling out other IRS tax forms, such as Form 1099 and Form 1099-MISC. While completing these returns, the preparer needs to know your Taxpayer Identification Number. Form W-9 also serves to certify that your income taxes are exempt from backup withholding. If you complete the request accurately and fully, you can count on an exemption. Now you know what W-9 is all about and it’s time to start filling it out. How to Fill out a W-9 Form? W-9 form is a one-page form and it won’t take you much time to complete it. With PDFfiller’s powerful editing tools you can do it completely online and skip the time-consuming scanning process. You don’t even have to download the form to your computer or mobile device: Form W-9 can be easily found in the PDFfiller’s library of fillable forms. Use our search engine to find an editable copy of the request. The document opens in the PDFfiller editor. The fillable fields will guide you through the PDF making it even faster to complete. The Request for a TIN has three parts that you have to fill out. The first part asks for your personal information such as name, business name and mailing address. Here you should also check the appropriate federal tax classification and type in the name and address of the requester. In the second part of the form you have to provide your Social Security Number or Employer Identification Number. The third part is a certification. Here you can add your legally binding eSignature and automatically date the request using PDFfiller’s tools. Before submitting the form we recommend following these security measures: Make sure you know the requester and double check the information you provided in the request.